On this episode of the Girvin & Ferlazzo radio show, Sal Ferlazzo and Tara Moffett, two partners at the Albany-based Girvin & Ferlazzo law firm, take listener questions on personal injury law, hear shout-outs from three satisfied clients of the firm, and talk umbrella insurance coverage. Although there is no special guest, Sal brings his wife into the studio for the first time since nearly 2001, when Girvin & Ferlazzo started the radio show which seeks to give free legal advice to the Albany area. Since its formation in 1991, the firm has garnered an excellent reputation for litigation services, including municipal, commercial, education, real estate, mediation, and personal injury law. Listen to the whole episode and read the highlights below. Should the county control municipal waste? The first call of the show came from Mike Conners, the Albany County Comptroller, who was curious about a municipal law question: should the county be responsible for solid waste flow control? According to Mike, it makes sense that the county takes control of the soon-to-close Albany landfill. He suggests that if the county were to control the waste flow, even if a bit more expensive than burying, then it could actually recycle between 80 and 90 percent of the municipal solid waste. Sal agrees that the issue is timely and important, and that the Girvin & Ferlazzo talk show should ask an environmental lawyer on the show to discuss the matter in more detail. Mike also gives Girvin & Ferlazzo, and Sal in particular, a pat on the back for the excellent legal work they did on a landfill case. According to Sal, this municipal law case debated whether a colony landfill should have an operating versus lease agreement, and the court ultimately settled on “operating agreement” as the answer. Should a person applying for disability ride a motorcycle? Liz called in with an entertaining but highly relevant question about disability law. She wondered if it is smart for a person who is applying for disability due to a back problem to ride a motorcycle. Luckily, Tara was in the studio and specializes in disability law. Referred to as the Human Encyclopedia by Sal, Tara’s skillset in the area of disability law certainly proved useful for this question. She first advised that you don’t want to aggravate any injury. She also said that if applying for disability, the most important thing is to document all medical treatment and compliance – your doctor might have an opinion about riding a motorcycle, and this is important to have documented. Generally, when it comes to filing for disability, the decision will take multiple factors into account. They will first ask if the disability restricts daily living. The next question they will posit is what is the extent and nature of the activities you can perform. This part of the process might make riding a motorcycle precarious; if you’re saying you can’t sit down or remain in a fixed position, then it follows that it would not be recommended to ride a motorcycle. Tara refers to the “adult five factor” analysis when it comes to adult disability law. This analysis asks the filer a regimented series of questions about their disability, including if it is medically determinable, severe, elicits impairment, or limits ability to perform or secure any job you’ve previously held. As it relates to disability law, having an attorney can be invaluable because they understand the specific factors that are reviewed in a disability filing. During this same show, a caller named Cathy called to express gratitude to Tara for an excellent and non-stressful experience with Girvin & Ferlazzo. She corroborated Sal’s observation that Tara is a walking encyclopedia, and said that the law firm got all the information from doctors and that she could just forget about the whole case. Going through any legal process can be trying, so having a non-stressful experience is one of the highest compliments a client can pay. Sal mentions that clients like Kathy are the reason Girvin & Ferlazzo are in the legal profession in the first place — it’s all about helping clients during difficult times, especially ones that involve commercial, disability, or personal injury law. What insurance should I get for personal injury law protection? Sal and Tara, while not insurance salespeople, move on to the topic of additional no-fault coverage and how it can help in personal injury law situations. As an expert personal injury attorney, Sal advises that everyone should opt into additional no-fault coverage. Although cheap on a monthly basis, the insurance protects you if a personal injury should unfortunately happen. Sal mentions that an airlift itself is a staggering 46,000 dollars, and most basic personal injury coverage only insures up to 50,000 dollars. As such, anyone who has a serious personal injury befall them and doesn’t have this supplemental coverage risks tremendous financial strain. One customer who called anonymously and was therefore deemed “Socrates” provided living proof to the importance of additional no-fault coverage, as she was involved in a serious accident and used Girvin & Ferlazzo’s legal services to help her mediate her case. She called to report in as a happy customer, mentioning that she got an outstanding outcome and that the personal injury law team at Girvin & Ferlazzo helped her through a traumatic and devastating experience. Sal worked on Socrates’s case and specializes in personal injury law. He is one of the attorneys at Girvin & Ferlazzo named as a Super Lawyer. On the show, he explains that an independent, neutral company designates legal professionals as Super Lawyers, and that only five percent of the legal public receives this accolade. Does a contract supersede state law? Changing the subject from personal injury law, Sal and Tara field a call from Richard about at-will employment. Richard tells a story of a friend who was hired as a maintenance worker at a facility with a no-socialization policy with residents. The friend nicely helped a woman move furniture, and she invited him to dinner in return. Richard wonders if this action could be cause for termination, given the no-socialization clause in the contract. In the state of New York, Sal explains, everyone is an at-will employee unless they have a long-term contract. At-will employees can be terminated at any time for practically any reason, bar discrimination. In this situation, the burden falls on the employee to follow the stipulations of his hiring agreement. This debate cropped up a lot when Sal taught Law and Sports at the College of Saint Rose in Albany – in most cases, long-term contracts are the way to assure protection. 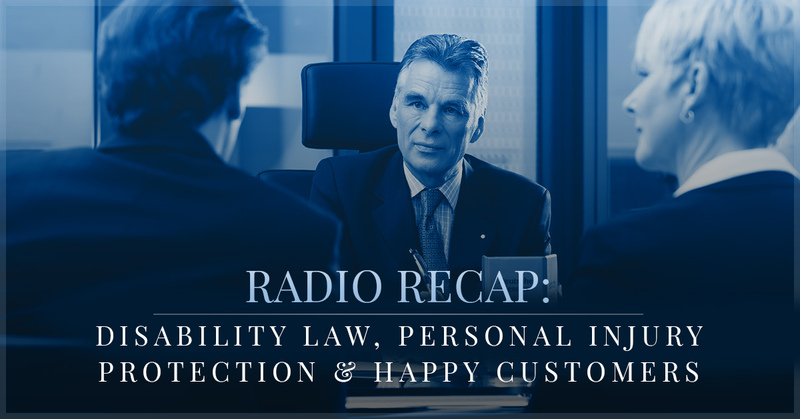 From personal injury worst-case financial scenarios to the details of disability law, this episode of the Girvin & Ferlazzo Radio Show covered it all. Tune into the Girvin & Ferlazzo Radio Show on Talk 1300.